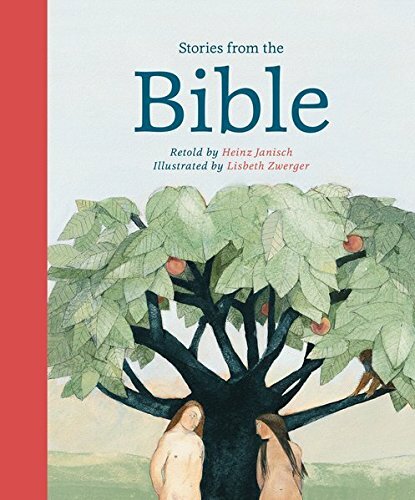 The team of Heinz Janisch and Lisbeth Zwerger returns with a revision of Stories of the Bible, originally published in 2002. The new 2016 version offers an approachable connection with the story of Jesus enhanced by thoughtful and interesting illustrations. Stories from the Bible is organized like a traditional Bible, with sections for both the Old and New Testaments. The Old Testament section includes stories from Genesis, Exodus, I Samuel, and Isaiah. The New Testament focuses on Matthew, Mark, Luke, John, and Acts with a final conclusion from the book of Revelation. With a total of 66 books in the full Bible, and only nine represented here in Stories from the Bible, there are many gaps in this simplified version. To remedy this, Janisch and Zwerger partnered with Mathias Jeschke, a theologist and Bible editor, to add notes, or brief explanations, that correspond with the selected stories. While the notes add a tiny bit of information, overall they do more to stunt the flow of the book and add confusion instead of clarity. The book opens with Janisch’s version of the story “The Creation of the World” coupled with a full page Zwerger illustration. Little illustration vignettes of plants and animals are peppered here and there. Then follows the story “Paradise” with another full page-illustration. In these first 18 pages there sets a solid start to Janisch’s story telling and Zwerger’s illustrative interpretations. But then a Jeschke italicized notes paragraph is tossed in on a barren page telling the reader more or less what they already read, what they will read next, and what symbols may or may not be interpreted within these stories. The notes paragraphs appear inconstantly with no real rhyme or reason four more times in the Old Testament section and eight times in the New Testament section. With comments about symbolism, theology, ancient societal trends, and conventional wisdom, and hardly any illustrations, it is obvious that these notes paragraphs are not intended for a four to eight year old audience but for the adult who is actually doing the reading. The Bible stories are all familiar ones and there is nothing new in the way Janisch retells them, or the way David Henry Wilson has translated them from their original German form. The real charm in the book is found in Zwerger’s illustrations. She is playful and serious, offbeat and classical, surreal and real. Zweger uses her own unique artistic perspectives, as in her “David and Goliath” and “The Sermon on the Mount,” in which she has made the subject matter larger than life. She also pays homage the masters of art history. In the opening illustration of the “Creation of the World” she mirrors the hand of God from Michelangelo’s famous Sistine Chapel; in the illustration of “Jesus in the Temple” she connects heavily with Johannes Vermeer’s “The Allegory of Painting;” in the final drawing in “The Gates Will Be Open” surrealist elements are reminiscent of Salvador Dalí’s “Figure at a Window.” While all of this artistic referencing will be lost on the young readers, it still serves to convey both a dreamlike and a realistic vision of God’s unseeable world of spirituality and the incredible, unbelievable story of Jesus. The downside is that out of the 144 pages of this version of Stories from the Bible, the 17 full-page illustrations are few and far between. Little groupings of characters and decorative elements fill in from page to page but overall many pages feel sadly sparse. Yet the illustrations do invite, encourage, engage, and envelop the readers, young and old alike, to ponder the mysteries and miracles of the Bible in a very tangible way.